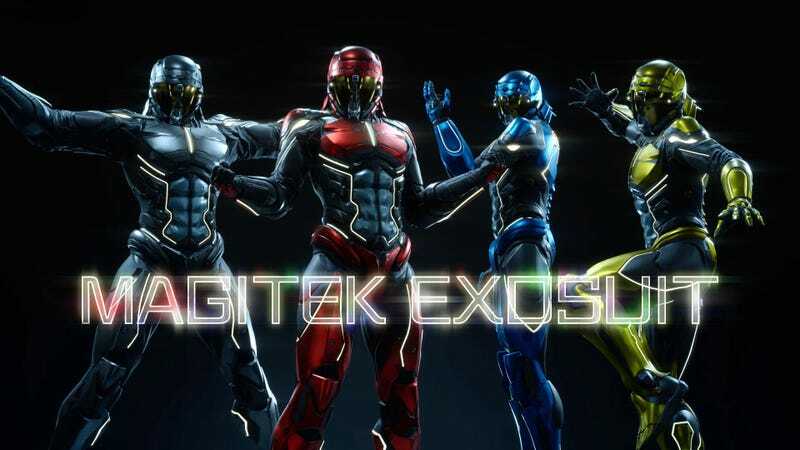 During Square Enix’s big Final Fantasy anniversary event, the Tokyo-based game maker revealed “muteki suits” (invincible suits) as an upcoming free Final Fantasy XV download. If you thought the outfits (above) looked like Power Ranger costumes, you were not alone. The costumes were slated for a February 21 release and would give players invincibility for thirty minutes as well as improved fishing abilities. The catch was that the outfits could only be used once only every 24 hours. However, soon after the outfits were revealed, it was pointed out that they looked like Power Ranger suits (below). Tabata added that they weren’t trying to make knock-offs. He did add that when the suits were first revealed, there were many articles by foreign journalists, stating that Noctis was turning into a Power Ranger. “They don’t look exactly the same, and as for the copyright, even if these are our original designs, it seems like they will cause problems for others,” Tabata said. Thus, the team decided to redo the suits and will release them at a later date. Ofuji also pointed out that these costumes are free and asked fans to look forward to the new designs.